NEW MOON IN PISCES – March 11, 2013 – Watery Energies Continue their Deluge!! Water, water everywhere!! Tomorrow afternoon around 4 pm (Eastern Daylight Savings Time) the Moon and Sun will be conjunct at approximately 20º Pisces. What to do with all this water? It depends on your birth charts planetary placements. For some of us, the energies of water will feel natural, flowing and creative. For others, it may be very frustrating to find ourselves unfocussed. We’re floating in right brain energies —a great time to check our intuition. With this much watery energies—grief may show up—to be purged (that’s a good thing!). I found myself grieving certain personal losses this past week and thus cleared out a lot of stuck energy I didn’t even know I had! I feel much better now. Mentally—during this period especially—I am giving it all up to Creator and asking for guidance. On the positive side, the Sun and Moon and other planets in Pisces can soften our perceptions and sensitize us to the feelings of others. The only Planets that are not in water include, Jupiter in Gemini (air) , Uranus in Aries (fire) and Pluto in Capricorn (earth). Uranus and Pluto are moving into an exact square (tense alignment) through the month of May—lots more changes coming. Uranus helps break through existing structures and Pluto digs down into foundational systems and issues. This combination may be very uncomfortable for any personal or collective beliefs and structures that are on shaky foundations. And, when breakthrough occurs, light gets in. Creative alternatives can and will arise. This continuing series of Uranus-Pluto squares will be occurring until May 2015. As well, watch for a sharp increase in energies—as Mars leaves Pisces and enters the fire sign of Aries on March 13. When Mars conjuncts Uranus in Aries—between March 17-27— abrupt changes can occur and move things quickly forward. This impulsive fiery energy can make all that water sizzle! Please drive carefully and handle knives and other sharp objects with care. MERCURY Retrograde goes Direct on March 17. Again—it’s time to make sure your data is backed-up! Widen your tolerance for unexpected delays in all areas connected with information and transportation. There is a way to maximize the positive side of this retrograde cycle. It’s a good time to review projects, plans, and arrangements. It’s advantageous to take time to be more reflective and slow down the speedy energies that can sap our strength. Please feel free to call or e-mail me with any questions you may have and certainly you can share this email with others. I look forward to hearing from you. Make sure you’re on Daylight Savings time (Spring ahead). 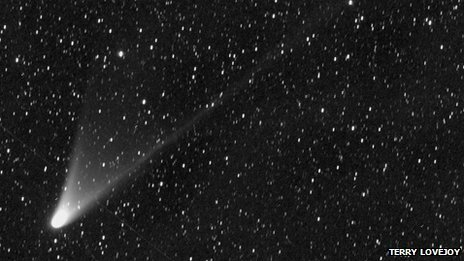 Stargazers could enjoy a rare spectacle as a bright comet swings into the Northern Hemisphere. The icy mass, called C/2011 L4 Pan-Starrs, should be visible with binoculars or a telescope from 8 March. But in the following days, it will become even brighter and could be seen with the naked eye. Astronomers in the Southern Hemisphere have already been treated to a fly past, with reports that the body was as bright as stars in the Plough.